Well, I’m not staying longer than the team, but I really am packing big…so are several of the team members…and we are giving YOU an opportunity to make an impact on some awesome little kids…but what is even more neat–the teachers there in Bolivia were blown away last year by the response we got when we had a “school supply drive”–and YOU helped. 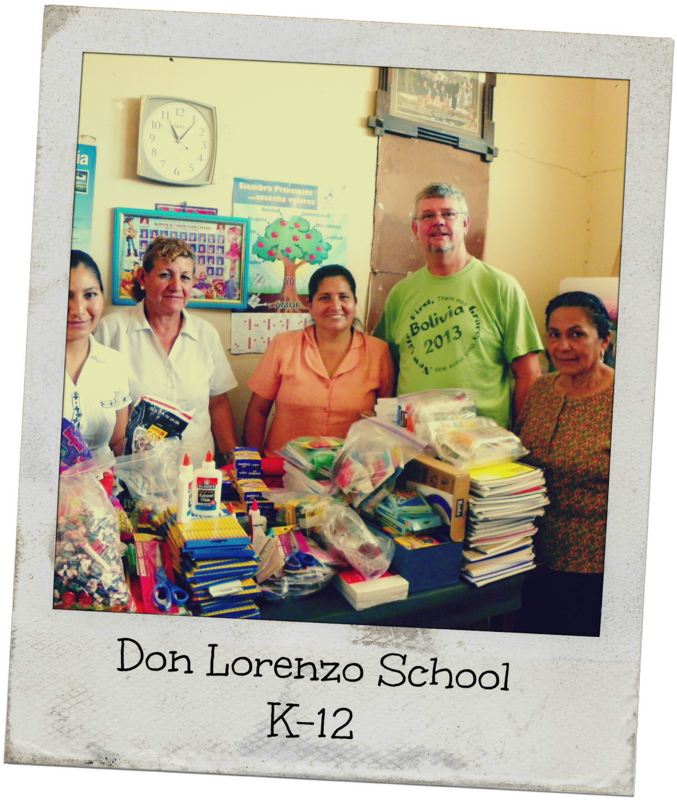 Many of you brought school supplies to the church, one of my dear friends mailed some in– another couple sent money to make purchases of supplies–it was so exciting! And we are at it again! This is one simple and fun way that you get to be involved in the life of a child…one that our team will share Jesus with–and hopefully, we BELIEVE, will be able to lead to Christ in that first week of September! Last year, the faces of the teachers, the look of incredulity was amazing. They ooooed and aaahhed over the pencils, erasers, and crayons. The chattered back and forth in excitement. It brought us to tears. God has opened a door for us to be used in this village where we built the first church and the school is located–and our desire is to keep working there in various ways until He redirects us. Please be in prayer as we work these last two months in preparation for August 30! We are taking New Testaments in Spanish to be distributed again–what a joy it was seeing them receive their first Bible! For each $2, you can buy a New Testament. You can put the Word of God in the hands of someone who has never had their own, and very possibly may never have their own copy without our help. Can you help? Anything you do will make a difference. This entry was posted on Thursday, June 26th, 2014 at 2:55 pm	and posted in Mission Trip. You can follow any responses to this entry through the RSS 2.0 feed. May the blessings of the Lord be upon each person going and all who will be there ready to hear and receive the love of Jesus in their hearts and lives. Blessings and safe travels in Jesus Name! Amen!